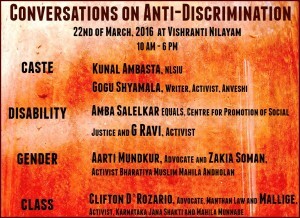 The four panel discussions on caste, disability, gender and class would be in the context of our work onanti-discrimination since the last two years, which seeks to explore possibilities of a movement against discrimination of all forms which could lead to the drafting of a comprehensive anti discrimination law that would address a range of concerns including caste, gender, religion, sexuality, gender identity, HIV status, race, region, color, articulation capacity etc. 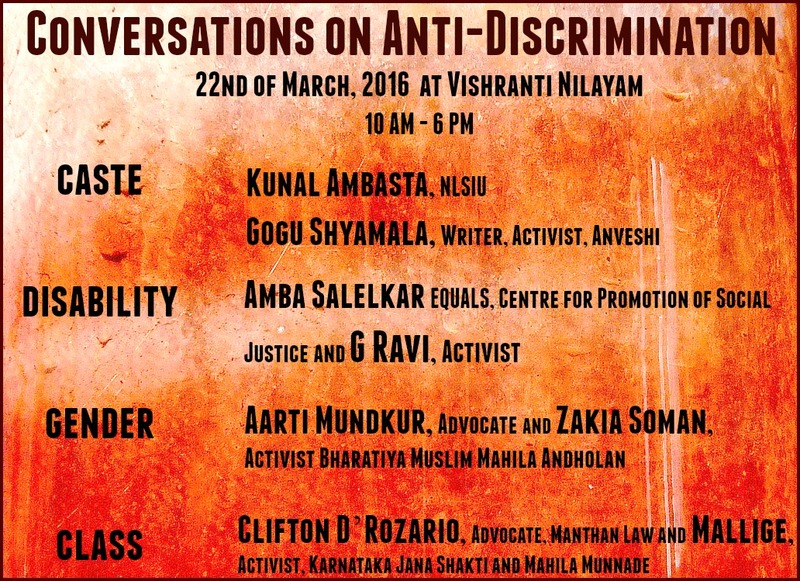 Towards this end we have interviewed 85 people including lawyers and activists from different states in South India. These interviews have opened up a range of questions that would in turn reflect our engagement with different movements and the possibility of a formulation of a law. The panel will be by way of a conversation wherein the two panelists will be asked questions by the person moderating the conversation and subsequent to which the floor will be opened for discussion.